Last week we headed to PIX11 studios to deliver our most exciting health & beauty deals yet, featuring coupon and promo codes from award-winning Murad skincare, organic discounter Vitacost, and the ever-relaxing Spa-Week. 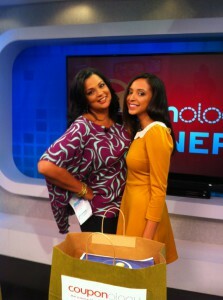 One by one, Krystal and PIX11′s Sukanya Krishnan revealed the beauty bags’ contents and brought on the savings. Watch the segment here. The first bag was from Murad, a global leader in skincare science. Murad is renowned for acne, anti-aging, age spot and cellulite treatments. Krystal showed off the E-Shield Radiant Skin Renewal and Resurgence Youthful Skin Renewal kits. The E-Shield kit is a must for everyone under the sun (literally! ), protecting the delicate skin from the harsh sun, wind and cold, revitalizing your natural radiance. The Resurgence kit exfoliates and boosts hydration, turning back the clock on aging by reducing the appearance of wrinkles. Our exclusive Murad coupon code will get you $20 off any $80+ order; looks like Christmas morning came early this year! The next bag’s contents from Vitacost, an organic and cruelty-free beauty & supplement provider, are all about youthful revitalization. From the Avalon Vitamin C Vitality Facial Serum which reactivates cellular renewal with antioxidants to the Devita Eye Lift Cream, looking youthful has never been easier (or healthier)! Another featured gem was argan oil from Acure Organics. We love argan oil for just about everything–its abundance of Vitamin E makes it perfect for moisturizing, preventing split ends, and healing blemishes. Use our Vitacost coupon code for an extra 15% off any Wellesse Supplement, and keep your eyes peeled for more savings! Rounding off our beauty showcase is Spa Week, with a super exciting promo code for 15% off all Spa & Wellness gift cards. Give the gift that offers universal appeal and unlimited spa-tential to celebrate this year’s Spa Week. From October 15-21, more than 5,000 spas nationwide will offer their most exclusive treatments for just $50 each. Anything from massages and facials to medical, hair, nail and fitness services are available during Spa Week. Visit www.spaweek.com today to find a participating spa near you. Although the celebration is time-sensitive, the gift cards are valid year-round and never expire. We certainly have some loved ones in mind for an overdue pampering session! Huge thanks to our merchants and friends at PIX11 for bridging the gap between health & beauty. Whoever said that pampering is a guilty pleasure? !